Don’t get me wrong, I’m on the Mookie band wagon much like I am with Xander and JBJ.. and now Brock Holt. But I question if he is really the hero our team needs right now. I find it funny that just a few months ago, this kid seemed stuck behind Pedroia and may have been a brief thought about as the centerpiece for a Mike Stanton mega-deal. I hope the Sox learned from their Gonzo experiment that even a player with such beautiful opposite field power was no savor for this beantown team. Heck.. Jason Bay seemed like a god for a year plus before loosing his talent with the Mets. 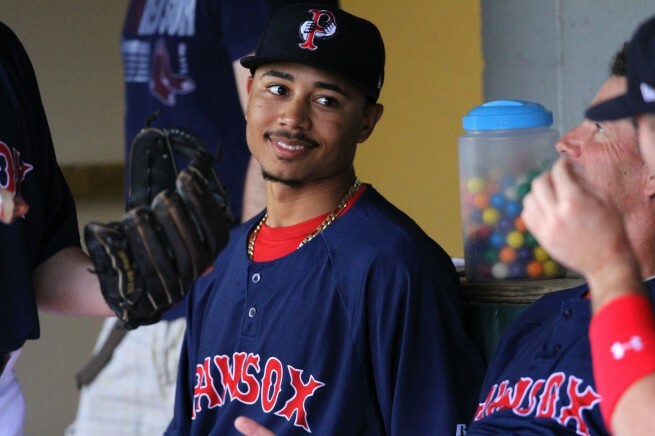 Now, Mookie, like Henry Owens and Xander seem all but off-limits as this trade deadline approaches. The major problem i have with this call up.. is that there is no real spot for him to get consistent at-bats. Is this just a cup of coffee? Is this to showcase him for the trade deadline? If the sox are serious about playing Mookie, who deserves his chance.. then a few other moves have to happen. 1) As nice has Herrera has been, he is now redundant with Drew on board. 2) Give Pedroia the occasion day off to let Mookie experience major league 2nd base. 4) trade Gomes/Nava/Middlebrooks/Doubront/Peavy- If we are going to let the kids play, then some of the veterans have to go. Middlebrooks is just having a Ryan Kalish moment.. a kid who looks so good in spurts but can be replaced by quality ballplayers in the minors. But since RH power is rare.. there is hope to keep him and get him confident. He can always go to the cubs in a year or two. I want Mookie to get 1 game in at Yankee stadium. I want an outfield of Holt in Left, Mookie in Center and JBJ in right. I want Xander to start hitting the snot out of the baseball. I want Peavy traded so that Rubby and Workman can carry this team to a surprising wildcard spot. I want the Rays to start winning against our AL east opponents. I’m excited to see this unfold.. but right now things just look like dirty laundry.